The Rapidaptor allows you to change bits quickly without any additional tools - with just one hand. In the case of the ring magnet Rapidaptor model, the floating, free-turning magnetic sleeve securely holds even large and heavy screws to enable immediate application. There is no need to hold the screw when applying the tool – something which can be dangerous and painful. Also ideal for overhead work. Magnetic design for easier application of the screw. Non-magnetic design so as to not to attract any metal filings. 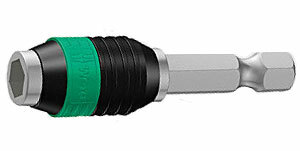 Rapidaptor rapid-in, rapid-out, rapid-spin, chuck-all, and single-hand technology, with strong permanent magnet. Rapidaptor easy-in, easy-out, rapid-spin, chuck-all, and single-hand technology, with strong permanent magnet. Rapidaptor rapid-in, rapid-out, rapid-spin, chuck-all, and single-hand technology, with ring magnet and stop sleeve for secure screwdriving on the holder. Note: NO retaining ring! Bit hold only by magnet!